The above screenshot is what I saw when I visited www.netscape.com in Firefox today. 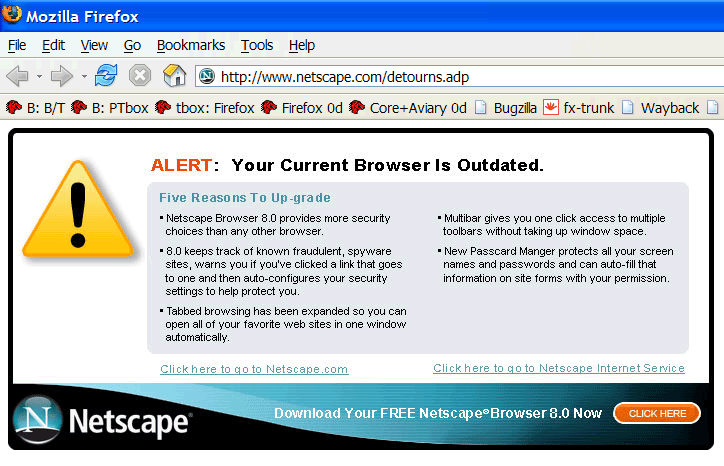 Amongst their claims is that “Netscape Browser 8.0 provides more security choices than any other browser.” Even if this is true, it does not make Netscape any more secure. It simply means that users are presented with more ways in which they can make their web browsing more insecure. Chief amongst these is the ability to use Internet Explorer as the rendering engine. Whatever the case may be, I certainly find it disingenuous that Netscape is branding my copy of Firefox outdated. But then again it’s Netscape. Did we really expect anything else? Not only that, they’re based on Firefox 1.0.3 not 1.0.4, so they launched a product with known security vulnerabilities, and said it was more secure than a version that has them fixed! Yes but it also does for IE and Opera. It is just a stupid move to get users to upgrade netscape 8. Basically you can’t see our site if you don’t have Netscape 8.